The “Poker Brat”, Phil Hellmuth, has once more proved why he is the most feared player at the World Series of Poker. On Tuesday, his WSOP dominance prevailed yet again, earning the American poker pro his 14th, personal-best, record-breaking bracelet. Hellmuth’s nickname, Poker Brat, is well dissevered, known for possessing some of the most emotionally diabolical mood-swings the game has ever known. Likewise, his title of most successful WSOP player in history is equally justified, and wholly more respectable. Phil Hellmuth now holds 14 WSOP bracelets, while his nearest rivals – Doyle Brunson, Johnny Chan and Phil Ivey – lay claim to 10 each. Now 50 years of age, Phil Hellmuth has been scooping WSOP jewelry since 1989, when his very first bracelet came in the 1989 WSOP NL Holdem Championship. The WSOP Main Event has eluded him ever since, but 1st place finishes have not. The Poker Brat earned his second WSOP bracelet in 1992, grabbed three more in 1993, and another in 1997. 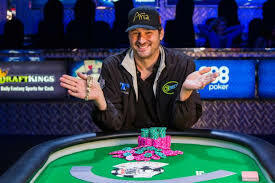 After the turn of the millennia, Hellmuth was at it again, collecting bracelets in 2001, 2003 (x2), 2006, 2007, 2012 (x2, including WSOP Europe Main Event Championship) and his latest in 2015. Throughout the years, the Poker Brat has mostly dominated Holdem events. Limit, No Limit, Pot Limit; he’s overcome them all. In fact, 12 of his 14 bracelets came from Holdem events of some type. In the 2012 and 2015 WSOP, however, Phil Hellmuth found a new his niche in Seven-Card Razz. It’s little wonder Hellmuth would gear his interests towards less-common poker variants like this Razz. Throughout WSOP history, it’s been the veteran players who’ve found the most success in events like this one. There are so many strategic avenues to be conquered, that the pros have an unrelenting tendency to dominate extra-curricular events like Razz. For the same reasons, they don’t draw an immense field either. Phil Hellmuth was one of just 103 players to buy-in to the $10,000 Razz Championship last week. On the third day, the married father of two found himself facing off in the final head-to-head battle with Mike Gorodinksy; a man in search of his 2nd WSOP gold. On the final hand of play, Gorodinsky would put himself all-in by 4th street, with both men drawing to 10-low. By the final card, Hellmuth had improved to 7-low, and Mike was drawing dead. After a few quiet words that surely amounted to “good game”, Phil celebrated his 1st place win, worth $271,105, and received his 14th WSOP bracelet. Gorodinsky earned $167,517 for his worthy efforts.